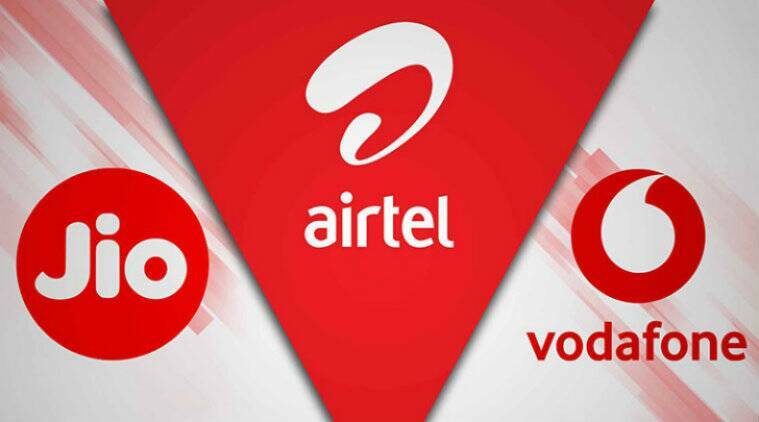 Reliance Jio vs Airtel vs Vodafone top postpaid plans under Rs 600: Which postpaid plans under Rs 600 from Reliance Jio, Vodafone or Airtel should you consider? We take a detailed look. The Indian telecom sector is now more competitive with players like Airtel, Vodafone and Reliance Jio bundling free subscription to streaming services and more benefits. For instance, free Amazon Prime and Vodafone Play subscription for 12 months is bundled even with the most affordable RED postpaid plan of Rs 399. 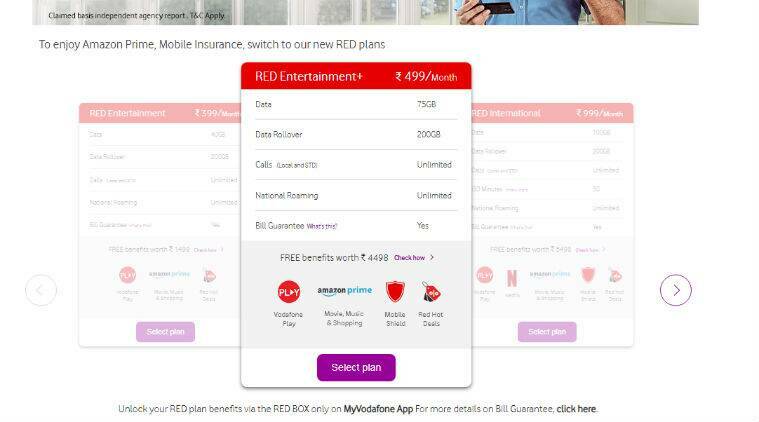 Similar benefits are offered by Airtel’s Rs 399 postpaid plan that offers free access to Zee5 shows and movies in addition to Prime and Airtel TV subscription. Reliance Jio users can avail complimentary subscription to Jio apps like JioCinema, JioSaavn, JioTV, and more. With Vodafone RED Rs 399 postpaid plan, subscribers can avail 40GB data per month with data rollover up to 200GB. The plan also bundles unlimited local and STD as well as national roaming calls. More benefits include free access to Vodafone Play and Amazon Prime for 12 months along with coupons worth Rs 399 every month. Vodafone RED postpaid plan of Rs 499 includes the same benefits as its Rs 399 plan. Vodafone RED postpaid plan of Rs 499 includes the same benefits as its Rs 399 plan, though the data is more at 75GB per month. Plus, users can avail device protection worth Rs 3,000 in addition to coupons worth Rs 499 per month as well as Vodafone Play and Amazon Prime subscription for 12 months. Reliance Jio’s Rs 199 postpaid plan offers a total of 25GB data. Reliance Jio seems to offer only one postpaid plan, though more ISD and international roaming plans for postpaid users are also available. 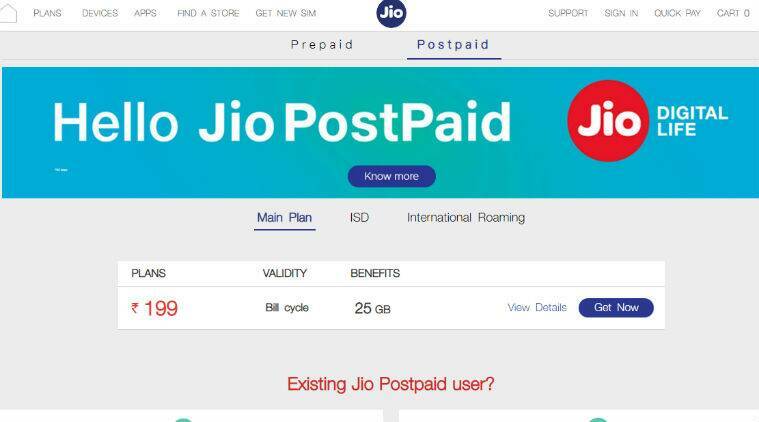 Jio’s Rs 199 postpaid plan offers a total of 25GB data till bill cycle in addition to free voice calls, 100 SMS per day and complimentary subscription to Jio apps. Post exhaustion of data limit, users will be charged at Rs 20 per 1GB data. Airtel’s postpaid plan of Rs 399 has benefits like 40GB data with data rollover 75GB, unlimited local, STD and roaming calls as well as one year subscription to Amazon Prime. It also includes free access to Airtel TV as well as Zee5 shows and movies. Airtel’s postpaid plan of Rs 399 has benefits like 40GB data with data rollover 75GB. Another plan under Rs 600 available for Airtel postpaid users is Rs 499 plan, which offers a total of 75GB data. 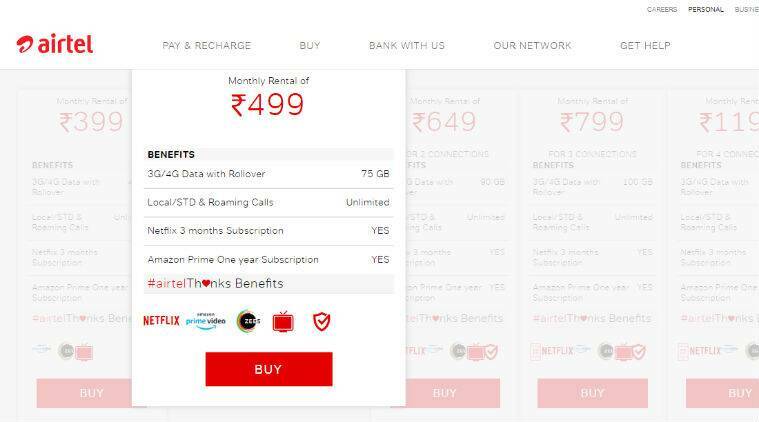 Apart from all benefits of Rs 399 plan, users who go for this plan can avail three months Netflix subscription for three months as well as handset protection. Users have to separately claim the Amazon Prime and Netflix subscriptions, just like on Vodafone.